Bring 1-inch of water to a boil, add salt then green beans, cover and cook 2 minutes, then add asparagus and cook 3 minutes more. If using pencil asparagus, blanch for 1 to 2 minutes. Drain well and cold shock vegetables in ice water to stop cooking process. Drain the vegetables on clean kitchen towels to dry completely. Thinly slice the green beans lengthwise on an angle; pile them together and run your knife through them cutting them into 2-inch pieces. Halve the asparagus lengthwise if thicker, leave in spindles if thin, then cut the spears into 2-inch pieces on an angle. Combine the beans, asparagus, 1/2 cup of parsley and onion in a shallow bowl. Combine the lemon zest and juice, remaining 1/2 cup of parsley and herbs in a food processor with cheese. Turn processor on and stream in EVOO. Season the dressing with salt and pepper and pour over the salad. Season the sliced tomatoes with salt and garnish salad with them. In Recipes-list.com we have selected the most viewed recipes from category - uncategorized . Enjoy the best recipes specially selected for you! 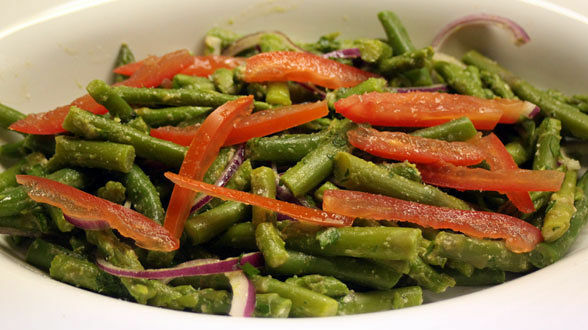 Asparagus and Green Bean Salad is the right choice that will satisfy all your claims.